This form does not replace a grievance, a declaration of a dangerous situation or an incident-accident report. The healthcare network is the target of repeated budget cutbacks. The healthcare professionals personally suffer the consequences and witness first-hand the disastrous impacts that these cutbacks cause the patients. The nurses, licensed practical nurses, respiratory therapists and clinical perfusionists must be able to reveal the abnormalities that they face and they must be able to do it without fear of reprisals from their employers. They can now move on to action, to defend the rights and the interests of the patients. 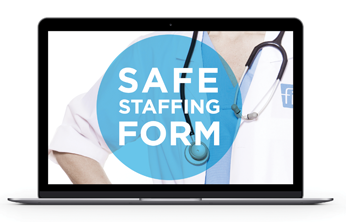 The FIQ making the Safe Staffing Form available to them, an online form, accessible at all times, which will be handled with the utmost discretion. The Federation is asking its members to report the situations where the conditions of their practice do not allow them to provide quality, safe and humane care, each time that this happens. It can be related to problems linked to the composition of the teams, the healthcare professional-to-patient ratios, the greater needs of the patients for care, etc. Specific interventions with the administrations of the institutions or any other appropriate body, can then be undertaken. It is by putting all of these situations together that the FIQ, in the name of their 66,000 healthcare professional members, can effect change. You can get involved in the movement too!